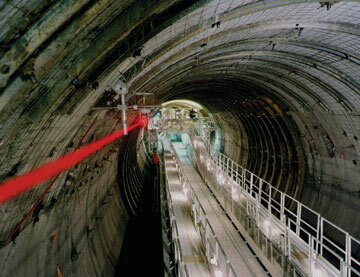 View of the rear of the tunnel boring machine showing the laser guidance system in operation at the site of the proposed Yucca Mountain nuclear waste repository in Nevada. After 30 years and $9 billion worth of federal research, Yucca Mountain is one of the most intensely studied pieces of real estate in the world. But the Nevada landmark — the proposed site of a national geological repository for high-level nuclear waste — remains shrouded in controversy. In a new report, two experts admit that scientists cannot answer every question about the site’s future security. Still, they say, it is time to move forward and build a carefully monitored facility. But the other factors, they say, would apply to many proposed repository sites and thus should not continue to hamper the project. One sticking point is the public’s belief that radioactive waste, once stored underground, cannot be accessed if new problems arise and the waste needs to be moved. That’s simply false, the authors explain. In fact, one of Yucca Mountain’s chief benefits is its openness to monitoring and possible future retrieval. The public’s more general discomfort with radioactive waste storage, they argue, stems from a fear of nuclear radiation, wariness of experts and NIMBY (“Not In My Backyard”) sentiments — not from technical questions about Yucca Mountain. One technical question does have some scientific basis — lingering unknowns about the facility’s security and its future stability. Yet that’s just the nature of scientific endeavors and pioneering projects, Winograd and Roseboom write: “The more we learn about a given subject, the more complex it becomes.” Given the vast time scales involved — much of the radioactive waste has a half-life of thousands or millions of years — precise predictions are an especially tough business. The best way to limit that uncertainty, the authors say, is to build the repository in stages, initially as a pilot plan. “Each step of the process should provide feedback to the step that follows it,” Winograd says.